Jennifer Lopez and Drake have on media since last week because they spent time together, posted pictures of the together, affirmed that they like to spent time together, making music together and they were seen cuddling each other. This can’t seem to be enough for the two of them as Jlo prefer to cancel her performance so she can be with Drake, the mother of two went to assist at Drake’s NYE performance in Las Vegas. It doesn’t matter to Jlo that there is a 17 years gap between the two of them. 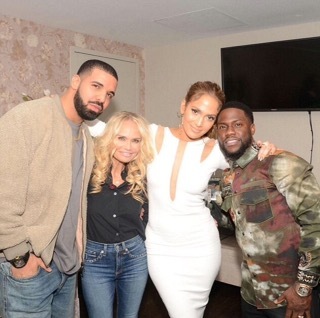 Jlo enjoyed her time at Drake concert at the Hakkasan nightclub. While Drake was on stage, Jlo has Tito hold Drake’s necklace between her breasts. And she looked beautiful with it! Drake sand his favourite songs of the moment like Fake Love, Hotline Bling and and also Work. Jennifer Lopez broke up with her ex tom boy Casper Smart. She enjoying her single life. She had a great musical year with songs like I ain’t your Mama. Drake took a picture of him, on the New Year Eve. They took a picture with comedian Kevin Hart.